Lawmakers are galloping back to Raleigh just one month after the N.C. General Assembly closed the 2018 short session — this time to scrutinize a ballot language that may dramatically affect November elections. The broad language leaves lawmakers an open field. But constitutional amendments, party politics, and the shrinking election calendar are primary reasons for their return. Legislators this year passed six constitutional amendments spanning victims rights, expanding the legislature’s appointment powers, voter identification, and hunting and fishing rights, among other things. It’s now up to voters to adopt — or chop — those amendments at voting precincts Nov. 6. Republican leaders are concerned partisanship will skew how those amendments are described on ballots. In the past, only a short description — written into the amendment’s bill by the legislature — appeared on the ballot. This year, it’s different. And timing is crucial. The commission faces a deadline — the week of Aug. 6 — to finish writing ballot language in time to print and distribute ballots for mail and in-person voting. In 2016, there were 1,422 different types and versions of ballots, show data from the Bipartisan State Board of Elections and Ethics Enforcement. 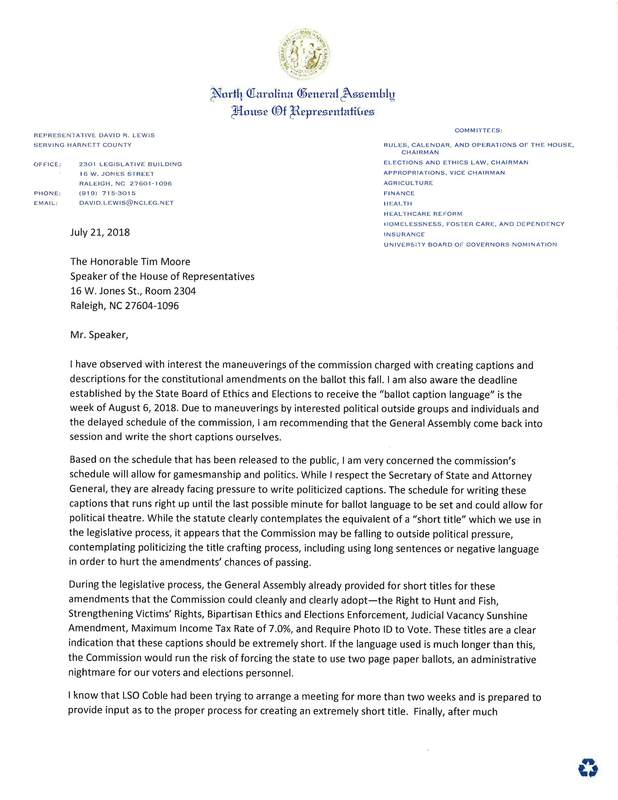 In a July 22 letter to Moore, Rep. David Lewis, R-Harnett, said he’s worried political pressure and maneuvering may push the commission to write “politicized captions” and “long sentences or negative language” that could keep the amendments from passing. “Due to maneuverings by interested political outside groups and individuals and the delayed schedule of the commission, I am recommending that the General Assembly come back into session and write the short captions ourselves,” Lewis wrote. 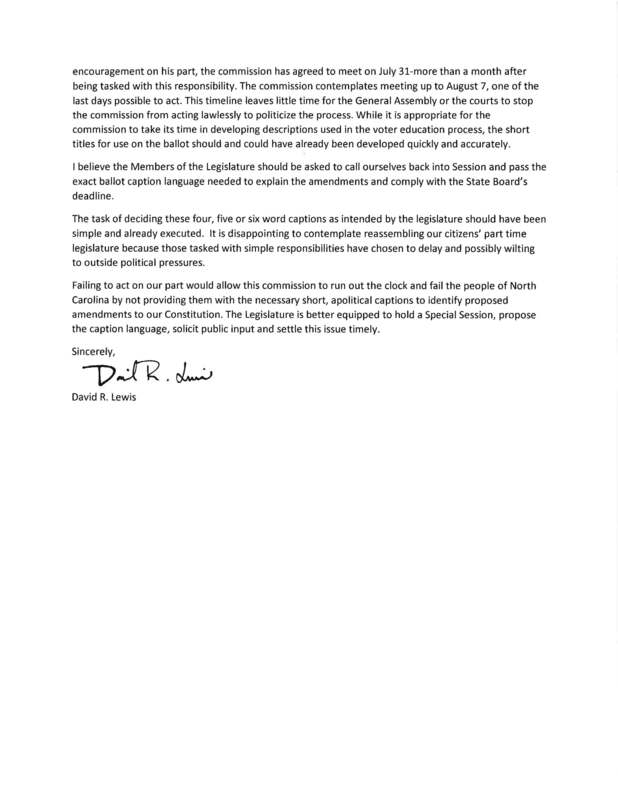 “Failing to act on our part would allow this commission to run out the clock and fail the people of North Carolina by not providing them with the necessary short, apolitical captions to identify proposed amendments to our Constitution,” he said. Voters deserve accurate descriptions of “extremely popular amendments,” Berger said. “It’s unfortunate that Democrats took what should be a simple process and attempted to politicize it in order to mislead the citizens of North Carolina,” he told Carolina Journal. 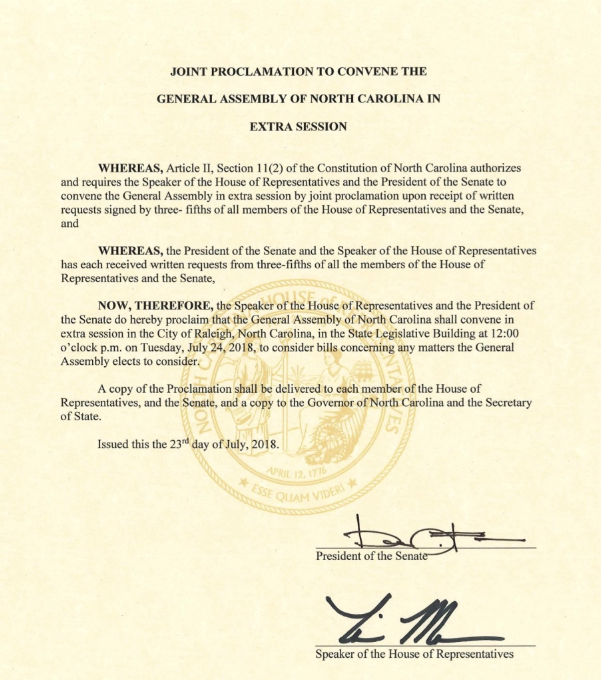 The commission comprises three state officials: Secretary of State Elaine Marshall, Attorney General Josh Stein, and Legislative Services Officer of the N.C. General Assembly Paul Coble. Marshall and Stein are Democrats. Coble is a Republican. Marshall and Stein aren’t politicizing anything, said Gerry Cohen, former special counsel to the N.C. General Assembly, and a longtime registered Democrat who recently changed his registration to unaffiliated. The commission’s website hosts a portal for public input. North Carolinians may submit suggestions until 5 p.m. Wednesday, July 25. The General Assembly’s discomfort with the commission’s ballot captions is puzzling, Cohen said, since it invented the law. CJ phoned and emailed multiple legislators, including Lewis, asking for more specifics, including why the law was enacted in the first place. Most failed to immediately respond. Rep. Jon Hardister, R-Guilford, House majority whip, said the legislation probably was an oversight on the part of Republicans. The commission wasn’t a good idea in the first place, and “I support repealing it,” Hardister said. The legislature isn’t likely to get rid of the commission, but lawmakers may block it from writing captions this year only, Moore told reporters Monday. Gov. Roy Cooper, who has said he would strike down any such legislation, will have 10 days to veto if the General Assembly remains in session. Using the full 10-day window would push a likely veto override close to the early August ballot-preparation deadline. Then there’s a possibility of a lawsuit, said Cohen. 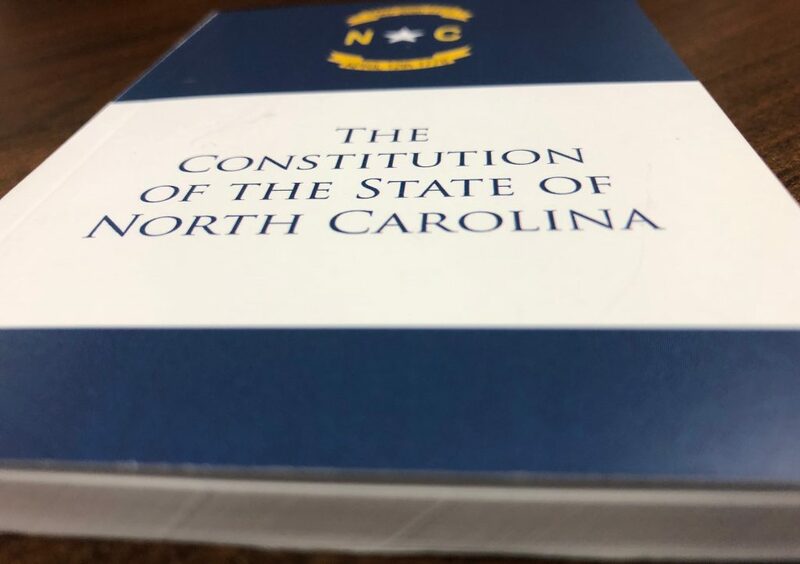 Interference from the legislature will probably gum up the situation, said Andy Taylor, a professor of political science at N.C. State University. Though some Republicans may want to follow regular procedure and not interfere with the ballot commission’s work, most will probably toe the party line because “they don’t want to look stupid by not actually getting it done,” Taylor said. The slate of amendments were placed on the ballot “for the purposes of increasing turnout in the election, rather than for any real interest in having these changes to the constitution,” Taylor said. Constitutional amendments can be a driver for election turnout, said Jonathan Kappler, executive director of the N.C. FreeEnterprise Foundation. But the current political environment makes this situation tricky, he said. “Will these topics become central to legislative races? Will it serve as a distraction? Given the subject matter of some of the amendments, will they reinforce Democratic campaign themes against the GOP-led General Assembly?” Kappler asked. It’s probable that, instead of pulling Republicans to the polls who might have stayed home, more Democrats will show up out of protest, he said. Anything could happen, given North Carolina’s ever-shifting and volatile 2018 election season, Kappler said. CJ intern Julie Havlak contributed additional reporting to this story.